Keeping you informed – This newsletter has been prepared to keep you informed of our proposals to develop a Resource Recovery & Renewable Energy Production Facility (the 3Rs) at the currently disused site on Fryers Road, Walsall. Reminder – In September 2013, Walsall MB Council granted BH EnergyGap full planning permission to develop a Resource Recovery & Renewable Energy Production Facility (3Rs) at the disused site on Fryers Road, Walsall. Design update – BH EnergyGap has been working closely with its contractors and specialist suppliers to progress the detailed design of what will truly be a state of the art facility. Planning update – BH EnergyGap has submitted a second application to Walsall MBC that will seek to vary the 2013 planning permission to include detailed design changes to suit operational requirements and ensure the plant complies with new environmental considerations. Walsall Council will be formally consulting on this matter shortly. What are the design changes? 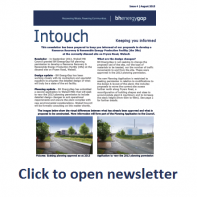 – BH EnergyGap is not seeking to change the proposed use of the site, nor the type of materials to be treated, nor the number of traffic movements to and from the site. These were approved in the 2013 planning permission. 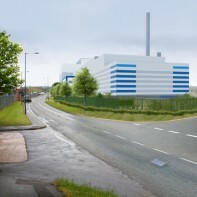 The new Planning Application is restricted to seeking permission in relation to modifications to the design & layout of the plant; this includes proposals to move the current site access further north along Fryers Road, a reconfiguration of building shapes and sizes to accommodate plant & machinery and to increase the stack height (from 65m to 98m). The images show the visual differences between what has already been approved and what is proposed to be constructed. More information will form part of the Planning Application to the Council. Progress to date – BH EnergyGap is in the final stages of negotiating funding for the project and it’s preferred main contractor and operator have been identified. Construction is programmed to commence in early 2016. BH EnergyGap’s contractors have been testing ground conditions and gathering information to be used to build the foundations of the plant. This will also enable any previous contamination on the site to be dealt with safely. Emissions – As part of the planning and permitting requirements to build and operate such a facility, a detailed study has already been undertaken and part of this looks at existing air quality and any additional emissions related to the 3Rs facility. Like most of the Black Country conurbation, Walsall is in an Air Quality Management Area. Therefore, to improve local air quality, consideration is being given to increasing the height of the stack from that in the existing permission and, whilst it may not ultimately be necessary to do it, permission is being sought from Walsall Council in the event it is felt best to do so. To operate the 3Rs facility, an environmental permit will also need to be issued by the Environment Agency (EA), and this will set the final height of the stack. Once the facility is operational it will be fitted with a Continuous Emissions Monitoring System. Monthly emissions data will also be available to view online. With the 3Rs Facility in full operation any adverse contribution to air quality from the plant will be insignificant. Building envelope includes offices, internal plant, extensive concrete structures, steel frame and walkways and machinery. 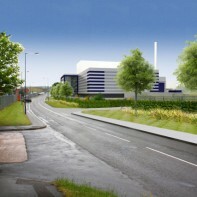 Contract for Electricity Supply – BH EnergyGap’s 3Rs facility in Walsall was one of only three advanced conversion technology plants to be successful in securing a contract from the Department for Energy and Climate Change (DECC) for the supply of renewable energy under the Governments Electricity Market Reform. This is great news for the project and is a refection of how waste can be used to provide cost effective electricity.